For the most comprehensive and up to date changes to this guide please refer to the Lock One Stop Shop. This guide has not been updated since 7.2! I'm known here on MMO-Champion as Woz (it's an old name that I thought was cool back when I started using forums) but I normally go by the name of Not. I've been around the Warlock community for the past 3 expansions but only recently started contributing with the start of Mists of Pandaria. I've played WoW itself since AQ40 but didn't raid seriously until Burning Crusade. I've played many classes as a main; Warrior in BC+start of WotLK, Shaman and back to Warrior again in WotLK into Cata (I did play Warlock in WotLK as a main alt and cleared all the content on it as well), played Warrior in Cata until the Maloriak wall and swapped to Warlock for the remainder of the expansion and have stuck with it since though thick and thin I just really enjoy the class as a whole. If you're looking to play a more distinct and varied spec to play in the new expansion than this is the spec for you! It not only offers a unique single target rotation but also a unique way of AoE. 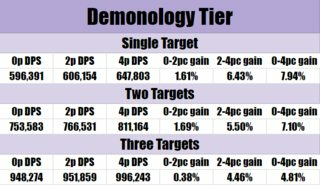 This guide will provide you with this basics of what you should be doing for Demonology in a PvE setting. Demonology has once again gone through very major changes for Legion in comparison to Warlords of Draenor. Gone is the old way of Demonology with Metamorphosis and Chaos Wave and big damaging abilities and here comes the legion of demons to do your bidding. The spec has transformed into a more pet centric class where you have the ability to buff your demons and also deal some damage yourself but heavily relying on your demons for the bulk of your damage. Q: What is the Warlock Discord? A: You can join us on Discord here, it's a direct link to the Demonology channel. Q: Where can I find a bunch of sims that are maybe useful or maybe not? Q: 7.2 is upon us, what has changed!? Swarms of the Black Harvest Increases damage by 10% and Stamina by 10%. Left Hand of Darkness Increases the damage of your pet by 5% (per trait). Jaws of Shadow Dreadbite increases damage taken from your Wild Imps' Fel Firebolt by 20%. Thal'kiel's Ascendance Demonic Empowerment has a 50% chance to enrage Thal'kiel, causing each of your pets to deal (50% of Spell power) Shadow damage to its current target. Each 3 point trait gains 1 additional node to it; Infernal Furnace, Summoner's Prowess, The Doom of Azeroth, Sharpened Dreadfangs, Maw of Shadows, Dirty Hands, Firm Resolve, Open Link and Legionwrath. It is also worth noting that 7.2 does NOT have any balancing changes (yet). All sims will be getting run again once SimulationCraft has the 7.2 information loaded into it, as of 3/24/2017 (guide being updated) the sims presented here are all for 7.1.5. Currently my thoughts on new trait pathing is rush to Jaws of Shadow, then take Infernal Furnace, Doom of Azeroth then TKA. Summoner’s Prowess, Sharpened Dreadfangs, Maw of Shadows, then the rest until Concordance. This is subject to change as SimC does not have every trait added (yet as of 3/26). Q: What you say is the lowest possible Haste % I can be at for a Single Target rotation to work? Q: What is the best way to use Demonic Empowerment? If you can't do a combo summon then cast Demonic Empowerment after the single summon. Q: I specced Hand of Doom, but it refreshes the DoT....does Doom still do damage? A: Yes, it still does damage. No matter when you refresh Doom it will deal it's damage after 20s. Regardless of Hand of Doom being talented or not. More FAQ will be added as they get asked more and more. Generally speaking something with Haste and either Mastery or Critical Strike will be best. This is our primary stat, everything we do scales with it. Haste rating increases the speed we cast, the rate our DoT ticks, the cast rate and attack speed of all your Demons; including your primary pet (Felguard), Wild Imps (summoned through Hand of Gul'dan), Dreadstalkers and Doomguard/Infernal. You will need 375 rating for 1% haste. Increases your critical strike chance by 1% every 400 rating. Versatility is purposefully designed to be a flat DPS gain, it increases damage and healing and reduces damage taken by a flat %. To gain 1% versatility you need 475 rating. The spell that we get from our Artifact is called Thal'kiel's Consumption, allowing us to drain 68% of our Demon's HP and deal that drained HP as damage to our target. It is a main part of how we deal damage and using this ability at optimal times will be crucial for our DPS. The main thing to learn with Thal'kiel's Consumption is that the health siphon does not occur until the end of the cast from all active demons. This particular spell is completely unaffected by haste so it will always be a 2 second cast no matter what. It will be important to keep in mind the duration of your pets so that you get maximum value from them. What does all that mean, you ask!? Each Demon type is assigned a value in relation to the value of your unbuffed Primary Pet. Because of this, your unbuffed Primary Pet (Felguard or any other Demon that is your permanent pet) is shown as 100%. 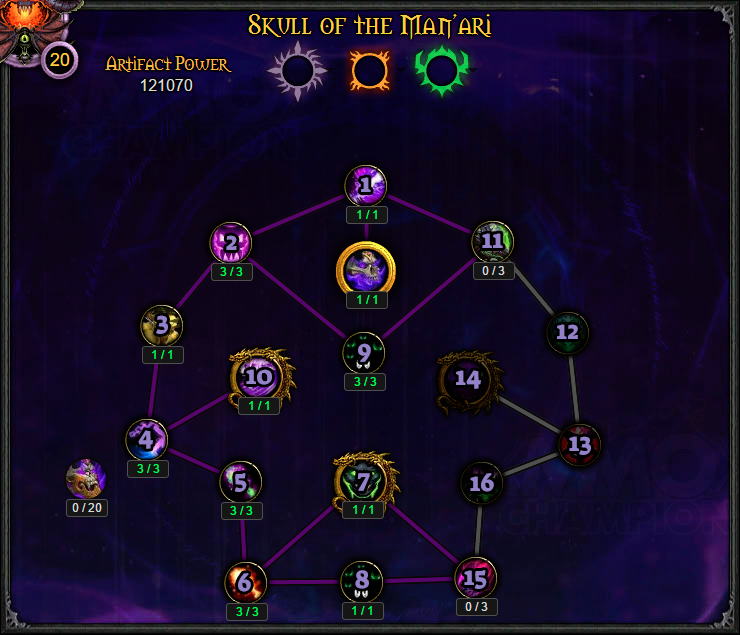 Upon first getting your Artifact you will have a trait tree that looks like this, Thal'kiel's Consumption and Breath of Thal'kiel as the only spots taken. Going forward you have a choice to make by going either to the left or the right down the weapon to reach the coveted gold traits. If you take a look at the Trait Calculator you will see that the right side of the Artifact is mostly defensive traits while the left side of the Artifact is basically all DPS oriented traits. 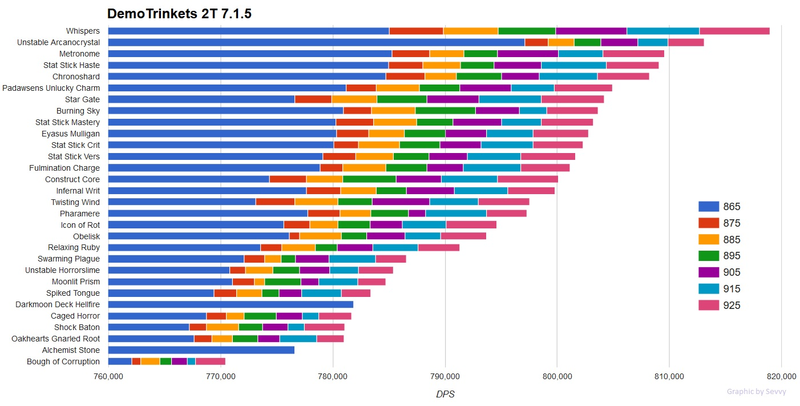 Speaking from a standpoint of PvE, your primary role as a Warlock is to deal the most damage possible, making the left path the best one for you. The Expendables is clearly the best gold trait with Stolen Power and Thal'kiel's Discord falling behind it in that order, at least for the direction of our Artifact tree that we'll be going for. The replacement for "losing" the Paragon trait from 7.1.5. This trait only affects your Felguard but is strong nonetheless considering how much damage your Felguard does. A very strong trait with incredible synergy with your Wild Imps. Upon Dreadstalkers being cast the mob affected by Dreadbite leaves a debuff lasting the duration of your Dreadstalkers that increase it's taken taken from our Wild Imps. Thal'kiel's Ascendance Demonic Empowerment has a 50% chance to enrage Thal'kiel, causing each of your pets to deal (50% of Spell power). This new golden trait is a single target ability that your pets cast when procced. It is currently still being investigated more as there hasn't been much conclusive testing done with this talent yet but it has been confirmed that this trait scales with abilities/buffs that affect your pets. For example; Soul Harvest buffs your pets damage, thus Thal'kiel's Ascendance will also be affected. Grimoire of Synergy does not affect your pets, thus would not affect the damage of Thal'kiel's Ascendance. In similar fashion is it currently believed that our Mastery buffs the damage of Thal’kiel’s Ascendance as well but it is unconfirmed. There is still discussion being had regarding the best order for the new traits in 7.2. Another one of the minor traits that is a very desirable trait to get a bonus with for your Artifact Relics. Increasing the damage of our Imps' Felfire Bolt and effectively increasing the DPET of our Imps exponentially. Your goal will to have either this or Summoner's Prowess as the bonus trait(s) from your Relics. One of the best minor traits we have. It makes your Demonic Empowerment stronger baseline, thus increasing their damage through faster attack speeds but also increasing your damage through Thal'kiel's Consumption with increased health. Your goal will to have either this or Infernal Furnace as the bonus trait(s) from your Relics. One of our many traits that is very simple in design yet can pack a punch. 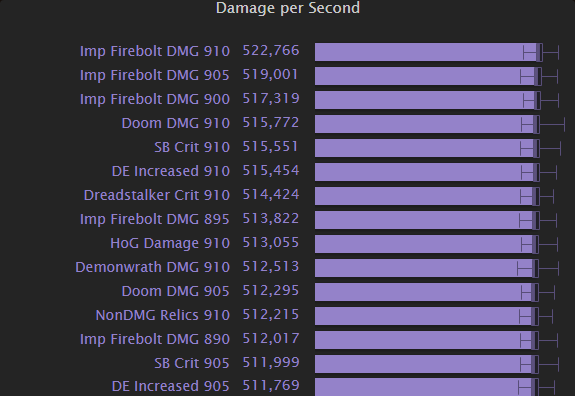 Increases the damage of our Doom by 10/20/30%, considering that Doom has all of it's damage backloaded it makes a hard hitting DoT even harder hitting. A trait that you will be wanting to get sooner than some/most others. I've lumped these two traits together since they do the same thing for different abilities. 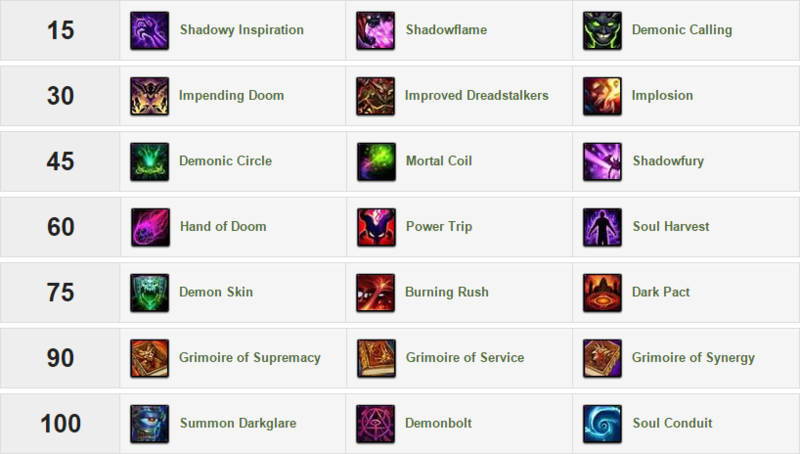 They both improve the baseline Critical Strike chance for Dreadstalkers and Shadow Bolt/Demonbolt. These minor traits are strong options to take as they are just flat damage increases. These are the other important traits but don't have relics that can increase their effectiveness, listed in order of best to worst. 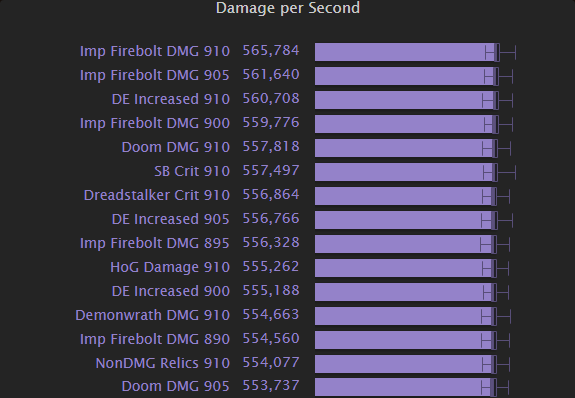 This trait is one that you'll get before The Expendables which is the only reason it's ahead of it in this list, simply increases the Critical Strike chance for your Wild Imps Fel Firebolt, a very strong trait for overall DPS. Our bread and butter major trait. It is currently the best overall major trait because you are summoning so many Wild Imps throughout the course of a fight you will have nearly 100% uptime on your Felguard and can have some decent uptime for your Doomguard/Grimoire of Service: Felguard/Darkglare (if you're using them). 10% damage boost for your Felguard for the whole fight is huge; you are rushing to get this trait as soon as possible. Another simple yet effective way to increase our DPS. Currently the trait has a 25% chance to proc for Doom to do double the damage. This talent will truly shine when you have multiple targets with Doom and they all live long enough to take damage from Doom. Even on Single Target this trait is highly effective since Doom has the potential for massive damage output because it only ticks once. This major trait is one that is in hot water quite often. People underestimate the trait with good reason, it seems like an absurd number of casts for your Wild Imps to cast to even gain the buff. 100 is a seemingly huge number of casts, but when you break it down a bit further it's not as horrible as it sounds. Just as an example if you have 35% Haste and 3/3 Summoner's Prowess with your Wild Imps affected by Demonic Empowerment they will cast 11.76 (so there is some RNG to it because it could be either 11 or 12) casts in their lifespan. Assuming worst case scenario that is 9-10 Wild Imps worth of casts and considering you try to get 4 Imps at a time, that's 3 Hand of Gul'dan casts per Stolen Power buff. It's not amazing, but it's also not horrible. It is our Single Target trait in contrast to Thal'kiel's Discord being the AoE major trait. Thal'kiel's Discord is our AoE major trait, it has a 15% chance to proc off Shadow Bolt/Demonbolt/Demonwrath and does splash AoE damage from near the target you're attacking. It's not a major deal for the most part since the damage of it is quite unnoticeable on Single Target and is a trait that requires you to try and proc it on the add/boss that the AoE will happen on/around. Due to the nature of our best artifact path you won't get this trait for a while as it will be more beneficial for you to level up your other Artifacts before going that deep into the Artifact tree. 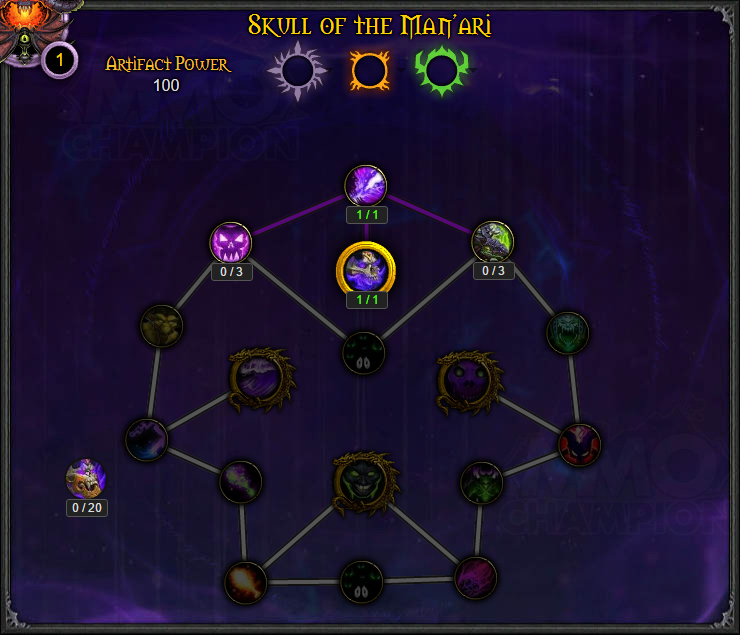 Currently the best place to look for an overall view of all the different appearances and colours for the Skull of the Man'ari is on WoWHead, viewable by clicking on this link then clicking on 'Appearances' near the bottom of the Artifact Trait Calculator. This is a rough representation of how gearing will look like in Nighthold. (2 Pieces): Increases your out-of-combat regeneration in outdoor Broken Isles zones. (4 Pieces): While you are below 35% health you take 50% reduced damage in outdoor Broken Isles zones. (6 Pieces): Intellect increased by 1,000. (8 Pieces): Spending a Soul Shard has a chance to increase your Mastery by 700 for 10 sec. (2 Pieces): Doom has a 50% chance to generate an additional Soul Shard. (4 Pieces): Dreadstalkers last 4 sec longer. These sims are using the above gearset from Nighthold (Mythic), there is a variety of sims you can view for Legendaries by clicking on the links below. Currently only showing the legendaries that provide an actual damage % increase or change the rotation, currently missing all combinations that include Sephuz, Norgannon's and Pillars. As an aide I have modified this spreadsheet as a tool that can be used in conjunction with the list below. It's a relic calculator comparing traits, it can be used as a rough guideline when trying to quickly compare relics - as always for the most accurate results sim your own character. Click the picture for a trinket calculator to give you an estimated DPS using 4P. If you prefer the old style of looking at the full stack of trinkets, click here. Neck: Enchant Neck - Mark of the Hidden Satyr or Enchant Neck - Mark of the Claw - it is advisable to use Mark of the Claw over Mark of the Hidden Satyr because as you add more targets to an encounter, Satyr drops off severely while Claw gains in value. These sims were done using the 908 iLvl BiS above - however the races translate in the same DPS difference across all iLvls. It should definitely be noted with the removal of our old Demonic Leap, Goblins have a huge potential for Horde Warlocks providing you with another movement ability on a 90 second cooldown. However overall the differences between races should be very minimal and you can safely play any of the races with success. Shadowy Inspiration: The biggest strength of this talent is by far the on demand Soul Shard gain you get from an instant Shadow Bolt, not only in terms of cast time but also in terms of movement. With how often we'll be casting Demonic Empowerment there will be plenty of opportunity to use this talent to the highest potential. Shadowflame: Shadowflame is just a remake of the old Hand of Gul’dan, has 2 charges and is best used in the same ‘stacking’ style as Hand of Gul’dan used to be. The exception being that you can make Shadowflame stack a 3rd time instead of being capped at 2, further increasing it’s damage. 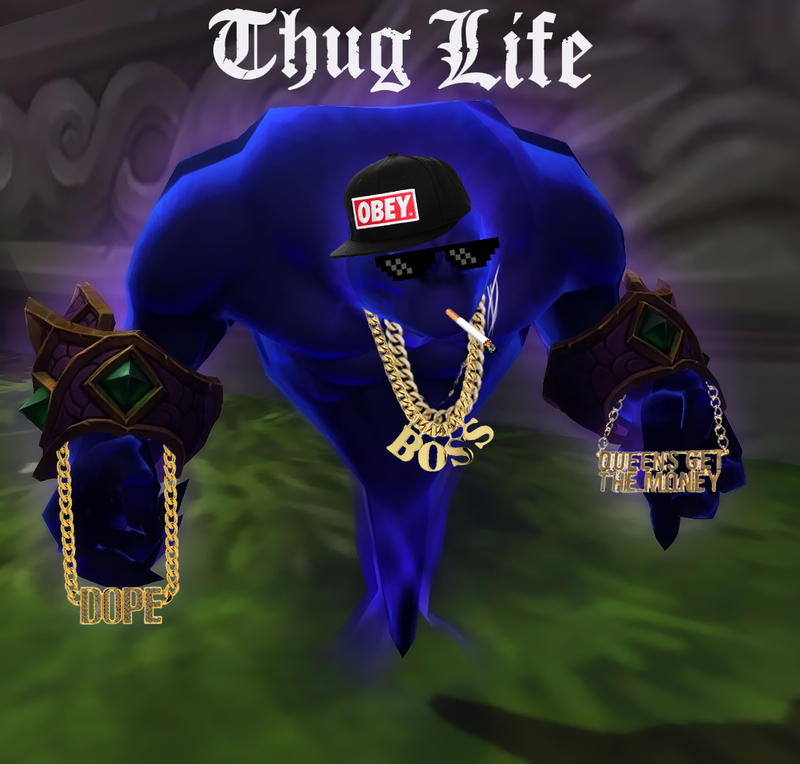 This talent also provides you with a ton of mobility options but since it is best used in the same way Hand of Gul’dan was in Warlords of Draenor if you use it and only get the damage roll of 1 stack it’s not really that great in terms of damage, however it gives you another option for tons of movement. Demonic Calling: There are also great strengths for this talent in the level 15 tier since it allows you a lot more freedom in terms of your Soul Shard usage, especially when paired with Recurrent Ritual. In effect it will turn Call Dreadstalkers into a Soul Shard generator (as long as you have a proc) giving you more opportunities to cast Hand of Gul'dan to bolster your demon army. Final thoughts: In light of some not so recent fixes in SimulationCraft there is a complete 180 in our talents for the level 15 tier; once there was a king named Shadowflame and it has been dethroned through debugging, in pure technical terms Demonic Calling now sits upon the throne with Shadowy Inspiration as the heir apparent, meanwhile Shadowflame has been demoted to the King's Jester. That being said; Demonic Calling is the "best" but has an RNG element to it that some players don't like while Shadowy Inspiration is a reliable source of Soul Shards for a minimal loss of DPS (1.3% difference between Demonic Calling and Shadowy Inspiration) and Shadowflame is now vastly subpar compared to the other two. Impending Doom: This talent will likely be the go-to talent for anything that is sustained AoE, as long as your Doom is able to tick. That caveat is actually the worst part about this talent since it pigeonholes you into knowing if adds will live past the point of Doom expiring since it would lose all effectiveness if they died prior to that point. Improved Dreadstalkers: Our single target option in this talent tier is a great option in terms of general DPS since Thal’kiel’s Consumption increases in output per pet we have, and this just gives us 2 more pets. Implosion: The primo talent for burst and sustained AoE; but it does require some finesse and luck with your latency, I'll go into that a little later. Making your Imps suicide into a mob is a great feeling and is funny to watch them rush over to the target just to explode. Final thoughts: Implosion is great for leveling, dungeons and just general open-world things since it provides AoE when needed and can quickly kill a large number of adds easily. It also has the advantage of being snap burst when needed for target swapping or for immediate damage to an add. Improved Dreadstalkers and Impending Doom will both have their advantages depending on what gear you have (Hello Kazzak's belt) and fight type. Demonic Circle: Should be usable in raids as a movement option when you need to go from point A to point B and back and forth, just like it’s used now. The worst part about this talent is that it is very cumbersome to use as it’s a 1 button talent as opposed to a 2 button ability. You’re forced to use a macro that cancels the buff in order for you to place your Circle in another location, which I think defeats the whole purpose of the talent in the first place. Mortal Coil: Mortal Coil has been a not so great option ever since they removed the ability for it to heal you when you use it on targets which are immune to the horrify effect (so any boss). Shadowfury: With the addition of a cast time to Shadowfury this talent also loses a ton of functionality that we otherwise have had for a long time. A 1.5s cast time for a 4s stun is lackluster and not a talent I forsee being taken for much of anything except maybe PvP. Final thoughts: This tier is a no brainer, Demon SkinDemonic Circle is hands down the best option and will always be the talent taken for basically anything aside from potentially PvP and M+. Hand of Doom: The sustained AoE talent for this row is a talent that is best taken in conjunction with a couple other talents (Summon Darkglare most notably but pairs well with Impending Doom as well) since it applies Doom through the use of Hand of Gul’dan. It will have particularly great synergy with Darkglare since Darkglare does damage to every target with Doom on it, which this talent supplies quite handily. Power Trip: If you're not into tracking more cooldowns or worrying about Hand of Gul'dan splash this will be the option for you. It's a very solid option in the overall scheme of things and allows you to concentrate on other aspects of your play. Soul Harvest: We have been given back another cooldown that has been sorely missed. This will very likely be the go-to talent for raiding, the power boost it gives you is simply too good to miss out on. It will give us some of the biggest Thal’kiel’s Consumptions and pairs nicely with multi-target fights as well. 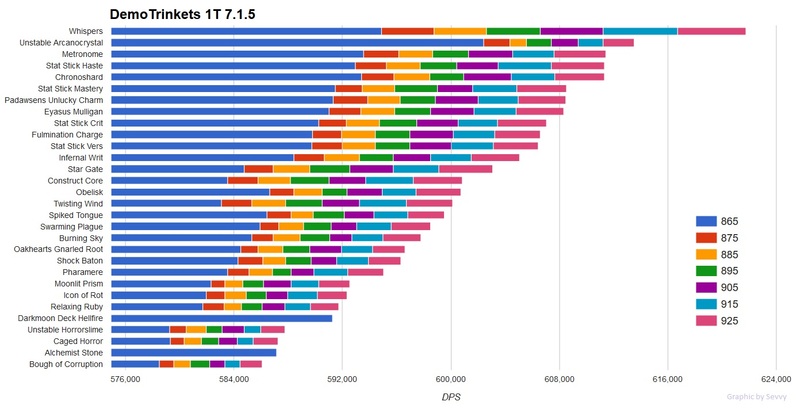 I’d say a good average duration will be something like 14-18s giving us more than enough time to have the buff for 1 round of Dreadstalkers, a full duration of Doomguard, multiple Imp rounds (probably 2 rounds of Imps) and a huge Thal’kiel’s Consumption. Much enjoy having this talent as an option. Final thoughts: Currently Hand of Doom is the best talent overall for all situations because of the saved globals from applying Doom manually (less 'maintenance buffs' to maintain = more demons to summon), there may be some funky things to happen with Soul Harvest in farm content however. Demon Skin: Having this talent move down to this row makes it a bit more interesting of a choice. It provies a solid passive option of additional Damage Reduction and give it a bit more competition across the row of talents. Burning Rush: Status quo with this talent, solid option for movement overall. It's worth noting that the damage you take from Burning Rush does not take away from the shield you generate from Soul Leech. Dark Pact: At first glance this talent seems out of place, but in reality it is a really fabulous option for Demonology especially. The shield you gain from Dark Pact takes it's shields from the health of only your Felguard including when it is empowered through Demonic Empowerment. It took a slight hit in potency because of the change of Health through Demonic Empowerment (from 50% to 20% extra HP). 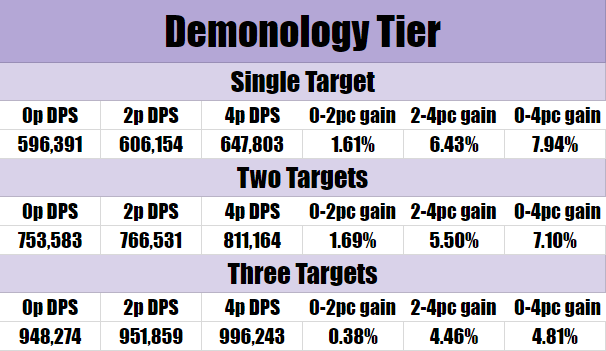 Final thoughts: This tier will be absolutely interchangeable depending on the type of fight you’re encountering but in general I would say Demon Skin or Dark Pact will be the go-to for progress, with Burning Rush left with farm and likely leveling. Grimoire of Supremacy: Grimoire of Supremacy is in a weird place right now as it is a very strong option for overall DPS especially single target through Doomguard. Grimoire of Supremacy was very strong at one point but they reduced Doomguard damage by 15% for Demonology only thus rendering this talent very seldom used. The other downside of this talent is that you lose one total Demon for Thal'kiel's Consumption damage. Grimoire of Service: This grimoire however will be one of the go-to's for this tier as it not only provides you with second pet for Thal'kiel's Consumption but allows you to have really strong burst AoE with a second Felguard and is a short cooldown for a relatively long activity time (90s cooldown with 25s activity). It is also a very solid option in terms of leveling for the same reason but will force you to pay more attention to your primary Felguard for healing (and yes, Health Funnel is ridiculously good so it’s worth saving the pet with it). Grimoire of Synergy: Grimoire of Synergy is still very strong, especially when you're able to pair it with either Implosion or Thal'kiel's Consumption since it scales the damage of both spells. Not only that but there is a very high up-time on this buff (close to 50-55%) so it is up on a very consistent basis. Final thoughts: As of right now the best overall talent is Service from 1-3 targets and Synergy overtaking it at 4+ targets, unless using Implosion for snappy burst damage as required. Summon Darkglare: Our AoE talent of the tier summons a Darkglare to attack all enemies with Doom (this is where Hand of Doom will come in handy!). It’s a very sustainable source of AoE damage and that’s exactly where the niche of the talent wants to be. Anything that is sustainable AoE this will be the talent to take (….along with Hand of Doom). Best talent for 2+ targets. 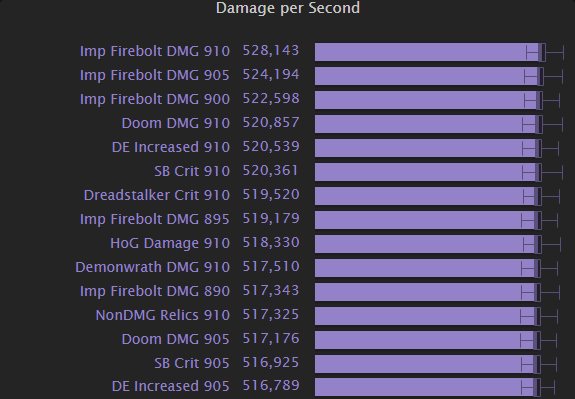 Demonbolt: Functions in a similar way that Thal’kiel’s Consumption does in that it’s buffed per pet we have out, it has great synergy with a number of talents and will very likely be the go-to talent for anything Single Target. Soul Conduit: This talent is a shining example of Demonology's toolkit since it fits a few different niches in terms of Single Target and AoE and fits very well into a more mixed playstyle. It's especially prevalent in dungeons where you may not want to be fully Single Target or fully AoE. Final thoughts: Overall I really like having the options available to me for this talent tier, it doesn’t have too much bloat or overflow while still providing you with some very solid options to choose from for a variety of scenarios. Single Target Demonbolt is king supreme but anything 2+ targets Darkglare or even Soul Conduit (with Implosion) is very strong. It is best to combo your Demon summons in sets of 2 if you can. For example: Doomguard + Hand of Gul'dan, Hand of Gul'dan + Call Dreadstalkers or Doomguard + Call Dreadstalkers. The following is using this spec: DC/ID/HoD/GoServ/DB or Darkglare. The reason it's between Demonbolt and Darkglare is because they are both viable depending on the situation; if there is a single priority target (such as the boss) that needs to be killed but there is also another target that is cleaved lightly, take Demonbolt. If the two targets are equally as important to kill take Darkglare. General Thal'kiel's Consumption usage: 2 Dreadstalkers, 6 Wild Imps - If possible, slide in Summon Darkglare as well if talented since it's a short CD that usually lines up with Thal'kiel's Consumption. The following is using this spec: DC/ID/HoD/GoServ or GoSyn/Darkglare. This rotation assumes you will have three or more targets to cleave consistently, if at some point there is a lapse of that situation (three or more targets) swap your generator from Demonwrath to Shadow Bolt. The damage it deals is spawned in a 10 yard radius from any of your Demons. In 7.1 they gave Demonwrath 'bad luck streak protection' so that it's more consistent with it's Soul Shard generation (same mechanic that Agony has in Legion). Damage from DoTs now do dynamically update every tick. Regardless of what buffs you have when you cast the spell every tick of damage will be different according to what buffs you currently have active on yourself. The timing of Implosion is as follows; Cast Hand of Gul'dan then next global is immediately 1 Implosion to ensure you blow up your oldest set of Wild Imps while not imploding your new set. Think of it as a combo move between Hand of Gul'dan and Implosion. The best usage of Implosion is to wait as long as possible before you implode your Wild Imps so that you still gain value out of their Felfire Bolts before you suicide them into whatever mob you're attacking. Ideally you would use Implosion with less than 3 seconds left on their duration unless you have another set of Wild Imps ready to come down with Hand of Gul'dan, then implode them before the new set spawns by casting Implosion directly after your Hand of Gul'dan. Doom damage will occur once every 20s (reduced by Haste) no matter when it's refreshed, this talent simply reapplies Doom for you so you don't have to do it yourself. Just like in WoD we have the 'Pandemic' effect as baseline for any DoT or buff effects you cast. You're able to refresh your DoT or buff (for us it's also most notable for Demonic Empowerment and Doom) at 30% duration remaining and not lose time on your DoT or buff. For example: Doom has a base duration of 20s, 30% of that duration is 6s. If you refresh Doom at or under 6s the remaining duration will carry over to the 'new' Doom. There are many addons that can display Pandemic range for your Doom, for Legion I will be using WeakAuras to display that information. In addition to all this because Doom only deals it's damage once over 20s you can still cast it during the Pandemic window and it will deal it's damage no matter when you refresh the DoT. It does damage once every 20s, period. The most optimal way of using Shadowflame is to take advantage of the stacking mechanic to get the most damage out of it as possible. It follows the same logic as Shadowflame stacking (or weaving as it once was) from previous expansions except slightly modified since you can stack the new Shadowflame to 3 instead of being capped at 2. Ideally you will want to use Shadowflame with the lowest time remaining on the debuff each time. Going much lower than 1s time remaining cuts it very close however. There isn't much for choice anymore since they are pushing each spec towards a particular direction when it comes to using a certain pet. For Demonology you are pushed towards using Felguard as your all-purpose pet unless you are using Grimoire of Supremacy, in which case you use Doomguard for single target and Infernal for AoE. Doomguard and Infernal have changed to become our main cooldown, replacing Dark Soul. It makes Doomguard and Infernal a more 'interesting' as you can cast it more often throughout a fight instead of just one time as it has been for a long time. Doomguard still casts Doom Bolt which retained it's execute function so it is still great sub-20% (but it is much better used on CD for Thal'kiel's Consumption). Doom Shards is an addon that allows you to track your Soul Shards like normal but has the added functionality of being able to predict/tell you when you will gain your next Soul Shard to avoid over capping. An addon developed by our lord and saviour Zinnin that is basically an all-in-one addon specifically for Demonology. It can relay all the important information you need to know in a compact area. Development of the addon is still in the works for more customization options but you can tie in aspects of zPets with Weak Auras making it an even greater tool to have. A godsend for multi-dotting! Takes all nearby enemy nameplates and converts them into a small grid that is clickable, can be moused over and can be focused. Excellent for all the issues you come into with nameplates and the new zoomed in camera! EnemyGrid has unfortunately become basically useless with the changes in 7.1, not a necessary addon any more. A number of things in this guide would not have been possible if it wasn't for the help of a number of people so thanks to you guys as well! Silver for being my theorycrafting monkey that I could bounce ideas off of. OOMM for making some of the most amazing Weak Auras so I don't have to stress over it! Zinnin for developing zPets and making my life easy by answering many questions. Woudini for the awesome new graphics! Terryn & Gahhdo for making Simcraft work. And to all my proof readers; Terryn, OOMM, Silver, Frescote, Woudini, Over - guide wouldn't have been the same without your input! Updated a few talents and added experimental Burst Rotation. Last edited by Woz; 2017-10-21 at 12:20 AM. i think you have 1 too many shadowbolts/demonbolts in your opening rotation because the prepull will generate you 1 shard so the "cast only when no proc" is one too many as you would be @ 5 already by then. Also one comment regarding stats. I'm assuming the 35% haste mark is the one that gives the Imps one full cast before despwaning. However is that two extra casts or one. If two what is the other haste breakpoint where master/vers/crit would be better than haste or haste to 35 is your number 1 priority? Haste to 28.25% > Mastery=Haste to 35% > Crit > haste to 40% > vers. I think it is better to stack Mastery /Crit untill you can reach the next haste breakpoint . Last edited by MrHappy; 2016-07-18 at 04:05 PM. Not, nice job as usual. One thing you might want to add or consider changing is that Shadowfury is actually really good for mythic dungeons, especially once affixes get involved. While it has a cast time, this is not an issue when chaining stuns after another class or if the stun timing doesn't need to be that precise (like that affix where they put the healing debuff on the tank). The other nice thing about shadowfury compared to WoD is that the stun happens at the end of the cast, so you actually get 4 secs of activity time while stunned compared to ~1.5 on WoD live because of the GCD. Last edited by wooters; 2016-07-19 at 10:37 AM. I knew I was forgetting something when I was reviewing the guide this morning. The stats stuff is mostly guessimation until SimCraft is out and fully working. I will make sure to include that. Haven't done much higher Mythic Dungeons than +2. Definitely something I didn't consider when I was thinking of the best way to sustain AoE at least in writing it out. Quick question: Why do you Dreadstalkers -> HoG -> Empower? Wouldn't that make roughly a third of the dreadstalker duration unbuffed? Or am I just misreading? is the proc demonic calling just an rng type of thing ? You want to Dread > Empower >Hog>empower.. Not sure if typo or you misread but if you look @ his blog where he demo's the WA. you can see him Empower right after every pet "summon"
yea normally you will get one ever 3-4 casts you have to be really unlucky to get 5 shards without DC proc. but RNG is RNG. which is part of the reason why the debate of Shadowy Inspiration will go on. with SI you will basically have a "free" shard after every DE which you will cast after each HoG/Dreadstalker with 50% chance of it being two shards if you take power trip. vs save 2 100% of the time (when proc occurs). I've tried it out and SI+Powertrip = pretty smooth rotation to give you quicker HoG's and potentially even bigger TK's consumption if your RNG is really good with Conduit. I think Demonic Calling will be mandetory when/if you get the Dreadstalker legendary and if you are taking Implosion because you want to spend shards on nothing but HoG's so free Dreads are basically a must. Should be titled Not's Demonology Guide. Nitpicking, but yes. Other than that, great read, looking forward to updates! No I typed it out in the wrong order. It should be Hand of Gul’dan, Call Dreadstalkers then Empower if you're doing the combo cast. Otherwise empower after every summon, basically. I'll be putting those in the FAQ later as well. Or something similar . I've been playing around with Demo on the PTR. It doesn't seem too bad so far, but Demonic Empowerment is proving to be confusing. How often should I be casting it, and when? Should I cast it just to keep the buff at 100% on my main pet? Should I be casting it after every Call Dreadstalkers? After every Hand of Gul'Dan? Do I need to recast it after popping Grim of Service and/or Summon Doomguard? I've been trying to cast Call Dreadstalkers, fill to 4 shards, HoG, then Empowerment, but I have no idea if that's right. Also has anyone worked out a Weak Aura to track its uptime on your various pet types or a WA to keep track of the number of imps available for thigns like Implosion? Should I be casting it after every Call Dreadstalkers? After every Hand of Gul'Dan? Do I need to recast it after popping Grim of Service and/or Summon Doomguard? Yes to all of the above. You have to cast Dem Emp every time you summon something new. It's just that essential in order for your minions to do real damage. Are we still using GoSuP even after the nerfs?